You may also wish to watch the movies "TinkerPlots Basics" and "Making Common Graphs" to enhance your knowledge of these topics. For this tutorial, you will look at data collected from high school students in the United States in 1990. First you'll learn how to enter your own data, and then you'll explore a sample data set included with TinkerPlots. Drag data cards from the object shelf into the document. 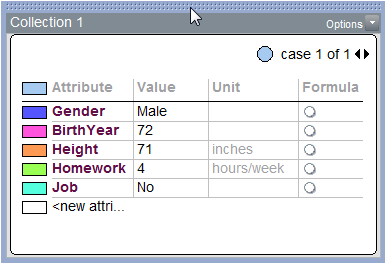 To add an attribute into the data cards, such as Gender or BirthYear, double-click and enter the name of the attribute. You can't enter spaces, so you'll need to distinguish multiple words with capital letters, hyphens, or underscores. For example, you might enter BirthYear or Birth-Year or Birth_Year. Enter all of the attributes from the table above into your data cards. Next, fill in the first student's values for each attribute. Click in the Value column, in the cell next to Gender, and enter "Male." Fill in the values for the other attributes. You can use the Unit column to record units, such as "inches" or "hours/week." Note that each data card holds the data for one person, or case. Click the right-arrow at the top of the data cards to create a new data card. Notice that the values in the Attribute and Unit columns are automatically filled in. Enter the values for the next two students into two data cards. You can also enter data into a case table. Click the data cards window to select it. Then drag a table from the object shelf into your document. Because you selected the data cards before dragging in the table, the attributes and cases in the data cards will appear automatically in the table. Enter these next two cases directly into the table. Notice that as you add cases to the table, the same cases are added to the data cards. The data you've entered so far were taken from one of the sample data sets included with TinkerPlots. Using all of the data in this data set will give you more to explore. Choose File | Open Sample Document. From the Social Studies folder, open the file US Students.tp. You may also want to explore what other data sets are available to you. This file contains data cards, a plot, and two text boxes. The text box on the left describes the data that were collected. The other text box asks questions you might want to explore using the collected data. Let's look at some different ways you can organize the data. Each circle, or case icon, in the plot represents one case - in this instance, a person. Click a case icon in the plot. Notice that this case automatically appears in the data cards. Click another case icon, and notice that a different data card is displayed. Click the attribute HomeWork in the data cards. This colors the case icons according to their HomeWork value. Because HomeWork is a numeric attribute - number of hours of homework per week - you see a color gradient next to the attribute in the data cards. Lighter colors indicate lower numerical values, and darker colors indicate higher numerical values. Click a case icon and drag it to the right. As you do so, the cases will separate into bins. Keep dragging the case icon to the right, and the cases will fully separate along a horizontal axis. Click the Stack cases vertically button in the upper plot toolbar to stack the case icons. Now click the attribute Gender in the data cards to color the case icons by gender. Click the Order cases vertically button to order the icons by gender. Click an orange case icon and drag it up. This will separate the data into two separate plots by gender. What do you observe? Experiment with making observations about data by choosing different attributes, stacking them, and ordering them. You can click the Mix-up button in the lower-left corner of the plot to start over. Now you'll look at some other ways you can plot data in TinkerPlots. First, you'll make a pie graph to see if girls or boys are more likely to have a curfew. Click the Mix-up button to scramble the case icons. Click the attribute Curfew in the data cards (you may need to scroll down to find it), and drag it to the horizontal axis of the plot. A black rectangle will appear in the locations where you can drop the attribute. What do you observe so far? Change the Icon Type to "Fuse Circular." If you see two circles, click the one on the right and drag it to the left until the circles combine. Click the Key button in the upper plot toolbar to show what the colors represent. Then click one of the Order buttons to estimate how many students have a curfew. It looks like about two-thirds of the students have a curfew. Click Gender in the data cards. 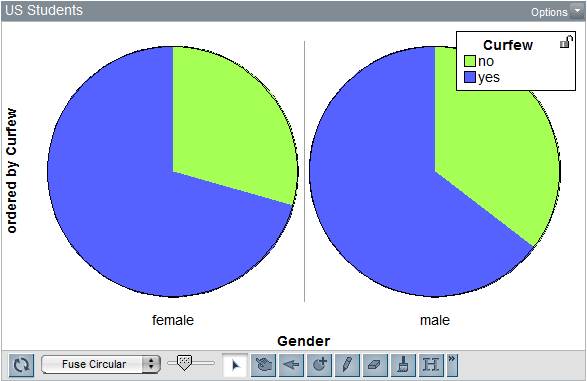 Then click one of the slices of the pie and drag it to the right to make two pie graphs. Click Curfew again in the data cards. Comparing the two graphs, is it more likely that a male or a female student will have a curfew? Next, let's make a bar graph to see how much money students were carrying when the data was collected. Click the Mix-up button to start with a fresh plot. Click MoneyOnYou in the data cards and drag it to the vertical axis. What do the five case icons on the top represent? Click and drag a case icon up to fully separate the values. In the lower plot toolbar, change the Icon Type to Value Bar Vertical. Then click the Order cases horizontally button. To see individual cases, drag the Icon Size slider (in the lower plot toolbar) to make the case icons smaller. What observations can you make about how much money these students were carrying? Finally, let's use a scatter plot to see if there is a relationship between two variables: the amount of time students spend doing homework, and their age. Click HomeWork in the data cards and drag it to the horizontal axis. (You may want to use the Icon Size slider to adjust the case icon size again.) Then click and drag a case to the right to fully separate the values. Click BirthYear and drag it to the vertical axis. 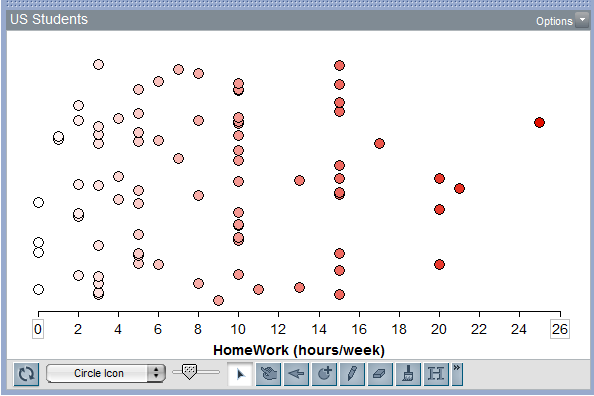 Then click and drag a case up to fully separate the values, creating a scatter plot. From this graph, does it appear that older students spend more time doing homework? Choose another two variables to explore, and see if there appears to be a relationship between them. Now that you have learned some of the basics of TinkerPlots, you will learn how to import data from an outside source. TinkerPlots can import data from a variety of sources, including a spreadsheet or the Internet. The data need to be organized in columns. Open an internet browser and go to the DASL library at http://lib.stat.cmu.edu/DASL. Click Power Search, then type "hot dogs" into the search box and click Search. Click and hold the Hot dogs Datafile and drag it into the TinkerPlots document. This will import the data at this URL into TinkerPlots. A new set of data cards will appear. Click through the data cards to make sure the data appears correctly. If you like, use some of your new skills to explore plots of these data. To import data from a Microsoft Excel file, open the file and select the data you want to use. Then choose Edit | Copy. Return to TinkerPlots and click to select data cards or a case table. In TinkerPlots, choose Edit | Paste. In the next tutorial, Analyzing Data, you will learn how to explore a data set to determine analytically whether there are interesting trends.